I just threw out great Aunt Alice’s African violet. It was almost dead, but a part of me still wants to rifle through the trash and try to salvage it. The dozen or so beautifully flowering violets Aunt Alice kept in front of her sitting room window are one of my favorite memories of visiting her home. Some of those plants were probably more than 50 years old when she passed away a few years ago. You can see why I feel guilty about dumping the plant in my kitchen garbage can. I have tried to keep the thing alive since it was given to me in her memory, but I have failed. I am not a good gardener. 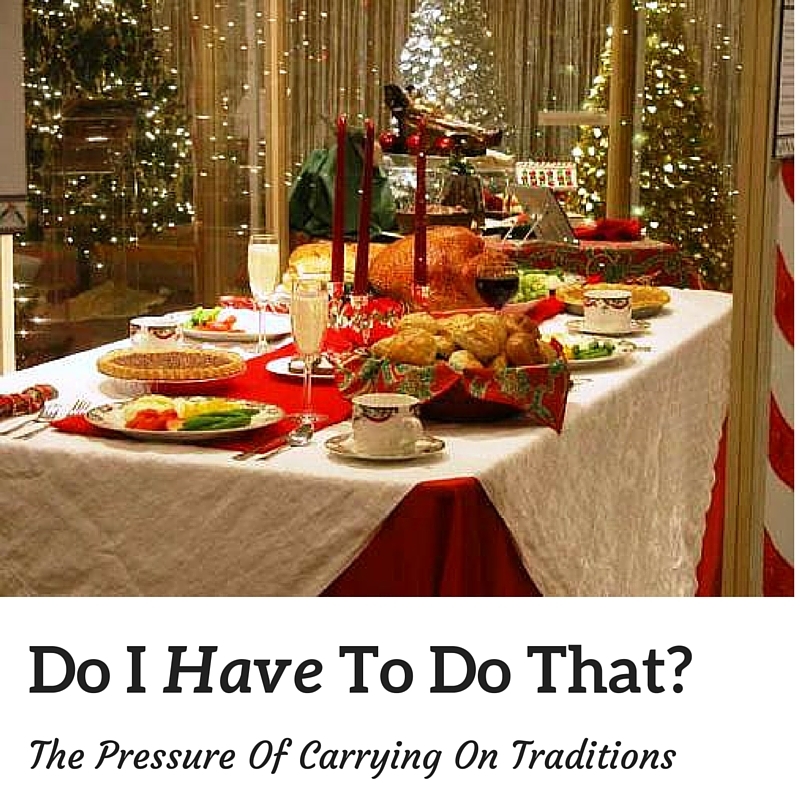 There are many traditions passed down in families, and I’d bet most occur during the holiday season. The pressure to make Aunt Helen’s noodle casserole just the way she did, or to match the fancy décor my mother in-law always displays at her dining room table can simply zap my love of the season. Truthfully, it has made me a grump for the past fifteen years of Thanksgivings and Christmases. Fifteen is the number of years I’ve been married; it is the number of years I’ve been hosting other family members for at least one of these winter holidays. This year, I want to start a new tradition. The Best-I-Can-Do-This-Season-Considering-I-Have-Four-Children tradition. It won’t include the pretty placemats I saw on Pinterest. It won’t include any fresh flowers. It probably won’t even include a clean house. But it will include my attention, my laughter, and my happy mood aimed right where it should be during this season—on all those willing to join us around the messy table where surely milk will get spilled. I am sorry to see the African violet go. I loved looking at them in Aunt Alice’s sitting room. But I’d rather hold dear the memory of the woman who was a marvel with these finicky plants than berate myself and get grumpy with those around me as I fight to keep the thing alive. If there’s going to be pressure, let it be pressure to focus on those in the house with me. It’s okay, I’ve decided, to let go of the expectations I put on myself to match the beautiful traditions in everyone else’s home. I changed my family traditions in the last few years also. Gone are the days of serving others who had come to expect me to cater to their every need. Gone are the days of me being angry and not feeling appreciated for all the work I had put in to making “perfect” holidays. My life is so much peaceful since I decided on creating new traditions. The old ones are distant memories. The new ones are wonderful.